Three technicians collecting a rotasonic core during a well installation in a west-central Minnesota, an area known for high-arsenic concentrations in groundwater. Photo Credit: Melinda L. Erickson, USGS. 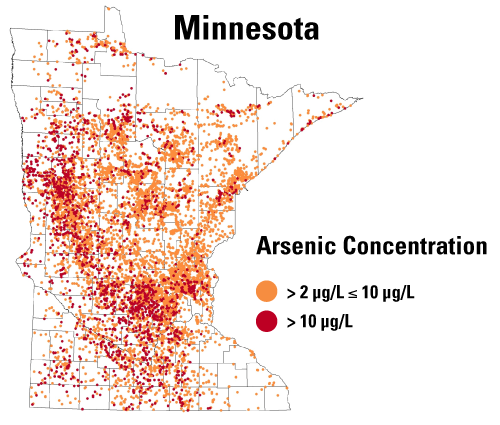 Arsenic concentrations exceeding 2 micrograms per liter in potable wells drilled in Minnesota between August 2008 and July 2013. Image Credit: Minnesota Department of Health. U.S. Geological Survey (USGS) and Minnesota Department of Health (MDH) scientists are assessing the distribution of arsenic in groundwater in Minnesota. 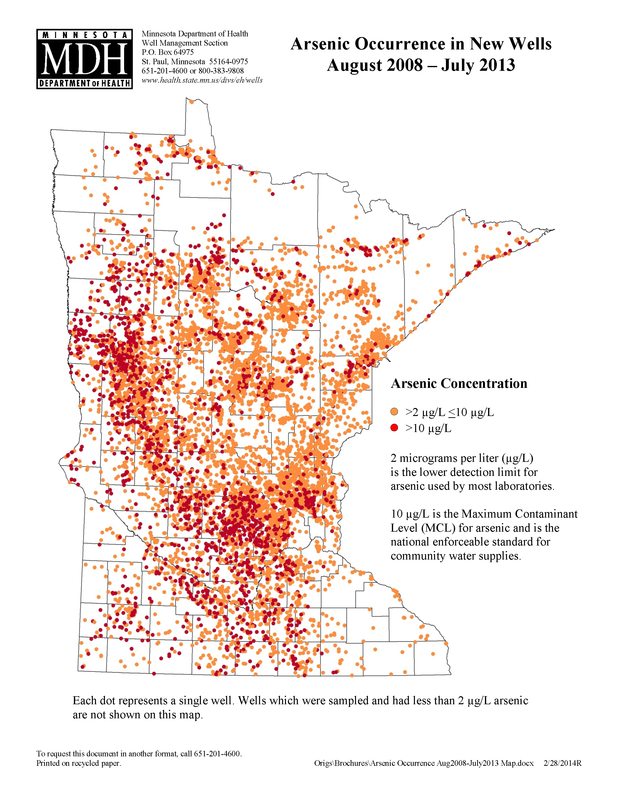 Naturally occurring arsenic is common in groundwater in Minnesota. About 15 percent of drinking water wells statewide have arsenic concentrations that exceed the Environmental Protection Agency (EPA) drinking water standard of 10 micrograms per liter. In a few Minnesota counties, more than one–third of newly drilled wells exceed this EPA standard. Drinking–water managers, well owners, and well contractors need to know where high arsenic concentrations in groundwater are likely to occur in order to take measures to protect public health. This study—scheduled to be completed in 2017—will provide knowledge of the major factors influencing the occurrence and behavior of arsenic in glacial and bedrock aquifers. Additional information about redox conditions, ammonia and iron concentrations, sediment chemistry, and shale content of Des Moines Lobe deposits could result in the development of effective predictive tools for locating high arsenic concentrations in groundwater. In 2008, concerns about human exposure to arsenic in drinking water prompted the MDH to adopt updated rules governing well construction in Minnesota, requiring analysis for arsenic when drinking–water wells are installed. The 2008 arsenic testing rule has resulted in more than 28,000 new arsenic measurements statewide, and could continue to add approximately 5,000 new analyses per year. 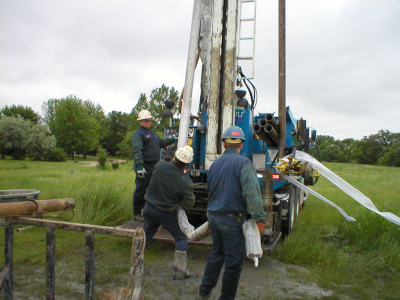 The USGS Cooperative Water Program and the Minnesota Department of Health, through the Clean Water Fund, are providing funding for this and other groundwater quality studies in Minnesota. † Hypertext links to non-USGS products and services; and the use of trade names, trademarks, company names, or other references to non-USGS products and services are provided for information only and do not constitute endorsement or warranty by the U.S. Geological Survey (USGS), U.S. Department of the Interior, or U.S. Government.